There have been plenty of civil cases against architects over the years, for all manner of negligence. But, today, an extremely rare criminal case was decided: An architect was sentenced to a year in LA county jail after pleading no contest to the manslaughter of a firefighter who died while trying to contain a fire in a home the architect had designed for himself. 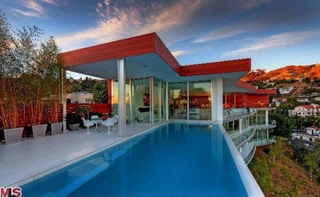 The case dates back to 2011, when a fire broke out in the Hollywood Hills home of a German architect named Gerhard Becker, who designed the building himself. The fire began in one of four fireplaces that had been manufactured for outdoor use but hidden within the houses itself; this means they were in clear violation of local building codes. The flames then melted a water pipe, which leaked thousands of gallons of water into a ceiling above the heads of the firefighters battling the fire. When the ceiling collapsed, it crushed 61-year-old Glenn Allen, who died the next day of his injuries. Becker allegedly had the fireplaces installed after the mansion had cleared its inspection, writing, "I want this to be installed after the final inspection so we don't have any final delays by the inspector." Becker was interviewed by fire investigators, but two months after they last spoke to him, he broke the lease on his home, sold two vehicles and flew to Switzerland and then Spain, where he began to build another luxury home. There he set up construction companies in the name of his wife, a yoga instructor, investigators said. It's extremely rare for an architect to be convicted in a criminal case of negligence, although it was much more common in earlier centuries, before the advent of legit standardized building code. These days, it's far more likely for a client to sue for civil damages resulting shoddy construction or a delayed project. For example, Santiago Calatrava is currently being sued for damages by his hometown of Valencia, whose eight-year-old opera house is already crumbling. One high profile instance that could've, theoretically, turned into a criminal case involved a shooting at a Frank Gehry-designed building at Case Western in 2003. Some wondered whether the complexity of the building's layout played a role in preventing victims from easily escaping. That question, however, like most others, involved too many other factors to place the blame solely on design. But, in the case of Becker, who intentionally misled building inspectors and endangered 80 firefighters, killing one, the blame is clear.